CLICK PICTURE TO VIEW VIDEO OR FOR MORE INFO! A Sunshine State resort has been transformed into a winter wonderland for the holiday season. Three-dimensional frozen ice caves, slides and sculptures make-up the Kissimmee, Florida attraction. 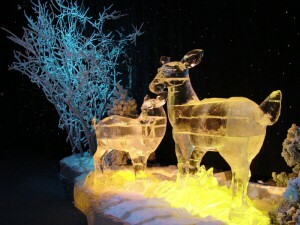 A south Georgia company supplied the ice that made the sculptures possible. Three different types of ice were used including colored ice, but a glass-like type of ice is what puts Cairo, Georgia on the map. Visitors to the Gaylord Palms Resort in Orlando can now chill out in the midst of frozen holiday figures and scenes, but the coolest thing about this attraction is that the most important part was made right here in Cairo. Two million pounds of this ice was shipped over to Kissimmee, Florida, but this is not the type of ice cube you find in you refrigerator. It' called crystal clear ice and it's pretty hard to come by. 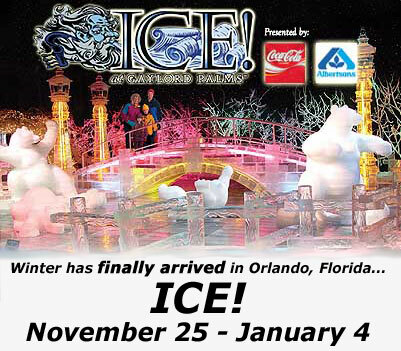 "M&M ice is the only company close enough to Kissimmee which is where Gaylord Palms is located that is capable of making the clear ice in the quantities that they need for the display," says David Hildebrandt. It took 25 days to carve nearly 5,000 blocks of ice made over a two-month period, but these guys are no strangers to this type of work. “We ship several hundred carving blocks a week to south Florida to go to sea on cruise ships for all the beautiful ice sculptures they have at banquets and buffets," David adds. 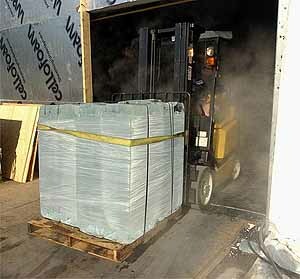 Preparing such a hot commodity, or in this case cold to be shipped off, is not so complicated. Chris Fortner says it actually an easy job, but the complex part is the next step. When it reaches the hands of the sculptors who shape it into a seasonal wonder, the attraction appropriately called “ice” is believed to be the first in North America. It will be on display until January 4. The centerpiece exhibit will be an 18,000 square foot enclosed area called "The Florida Fridge," where air temperatures will be chilled to 9 degrees. Customers will be issued a warm parka during their visit inside. The ticketed attraction will feature nearly 2 million pounds of ice, carved by hand over a three-week period and arranged in eight environments, including a cathedral with impressions of majestic old churches and a nativity scene as the finale. A ticket price for the fridge experience has not been announced. 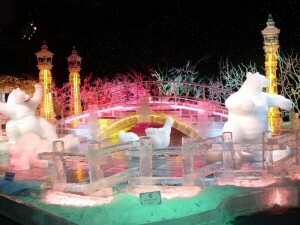 Other areas will include fanciful holiday figures and scenes, including playful polar bears carved from ice, the largest of which will weigh 17 tons. Many of the carvings and sculptures are more than 25 feet in length. Additionally, three ice slides will offer a chilly thrill. 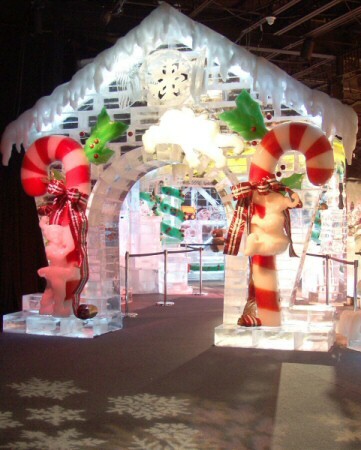 The exhibit is modeled after the Gaylord Palms Opryland's long-running seasonal celebration in Nashville. Nearly 5,000 - Blocks of ice will be carved and transformed into a winter wonderland. 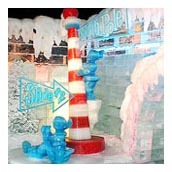 25 - Approximate number of days it will take to carve the ice into an elaborate holiday attraction. 112 - Independent sculptures contained within the 11 themed areas of the attraction. 0 - Chain saws used to carve the individual sculptures. The artisans prefer wood carving hand tools to sculpt each masterpiece. 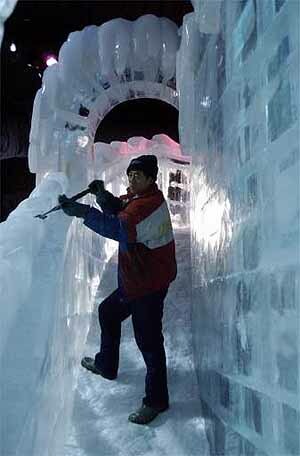 Power tools are used only to cut the large blocks of ice into manageable blocks and shapes for the artisans to stack. 9° - The average temperature inside “The Florida Fridge,” the enormous structure used to contain the attraction. 1,500+ - Lights that will be frozen within the ice. In addition, there will be approximately 400 theatrical lights exterior to the ice. (1) "Clear" - “glass-like” crystal ice makes up 80 percent of the attraction’s sculptures; (2) “White ice” blocks are more like compacted snow; (3) "Colored ice", which is dyed brilliant colors for highlighting and accenting the remaining 5 percent of the sculptures. Snow is also used as a landscaping feature, as well as “blown” ice used to frost displays. 18,000 - The total square footage of the “Florida Fridge,” the unique structure that contains the attraction. It is believed to be the first of its kind in North America. But don’t worry, everyone is given a parka to wear while exploring this incredible attraction. 41 – Days there are to visit this famous attraction before it melts away. The attraction runs from Nov. 25-Jan. 4. 1 - The number of other destinations in the United States that are as cool as ‘ICE!’ Sister property Gaylord Opryland Resort & Convention Center in Nashville originated the concept in 2001, where “Fantasy In Ice” has enjoyed a wildly popular two-year run.